First things first: grab a hasmat suit and headgear from the box near to me. The town's under quarantine, so you won't be able to go in without one. Excellent! I'll have the gate opened for you right away. Be sure to put on your Hazmat suit before you go through the gate! Click on the Hazmat Suit on screen 1. Click on the Hazmat Helmet on screen 1. As we mentioned earlier, this entire village is swarming zombies. You're going to have to fight your way through them, and see if you can find any survivors. We might have to just turn this into a rescue mission and then burn the whole thing down. Oh good, you found someone! Click on the survivor on screen 8. Boy, do I have some fin in store for you! I'm going to need some samples of this Dragon Plague, and also some samples of the snot he's been sneezing out. Luckily, the town is crawling with copious amounts of both! Just beat up on the Wandering Plague and Snotgoblins until you can gloop some into a jar. Chop-chop, time's a wasting! I can't wait to dive into this stuff! …I mean, you know. Not literally. Now, I just need a test subject. You know, to test my cure on, before I mass produce it to… uh, the masses! Just go catch me a Plague Zombie - pick one, and keep hitting it until you wear it out enough to tie it up. You might have to try a few times before you find one who'll cooperate. Yep! That'll do, Hero, that'll do. Time to help me mix up a cure! I've altered the samples you brought me - with SCIENCE! - and now, they should neutralize the virus when the come into contact with it. Start with a glob of the… well, the snot. And then slowly mix 3 drops of the altered plague into it. Once you have it mixed, give it to our test subject here! Hmm. I guess I should have known that would be too simple. Thanks to Exreal and Lord Vordred 101. I'm going to try adding some restorative herbs to the formula. You know what's one of the best herbal remedies around? Marsh Kelp. Luckily, there's a Marsh Monster lurking just outside of town. Beat him up, and take his kelp! Before I mix up a new test cure, I need you to go out and get me some fungus. But not just any fungus! What I need are Re-Shrooms! They rejuvenate, revive, and restore! You'll recognize them by their distinctive coloring: light green, with large white spots. Perfect. Let's try this again! Alright, let's try this again. Remember: Start with a glob of snot, then mix in 3 drops of Plague. Then add a handful of kelp, and exactly 2 of the mushrooms. As before, once you have it mixed, give it to our test subject. Blast! We're still now there yet. But we're getting close, I can feel it! 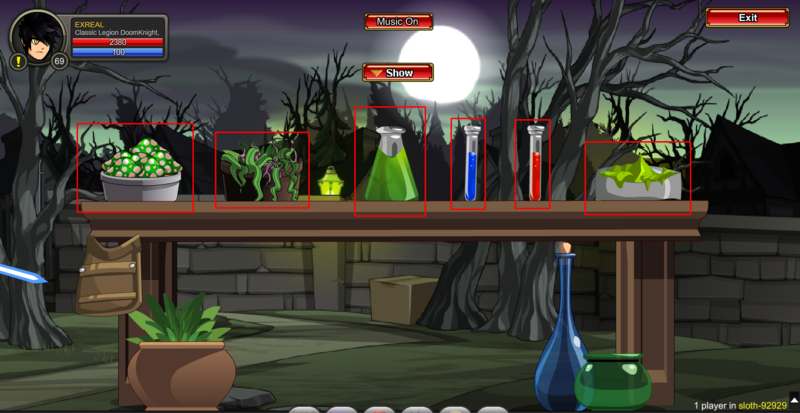 Maybe we need to shore up this science with a bit of alchemy - that's right, I'm taking potions! i don't have any with me, so I'll need you to get fetch some. Bring me a standard Health Potion, and and Airther Vitae. You can get the former from Reens in /arcangrove, and the latter from Phelan in /dragonhame. Third time's a charm? Well, let's hope so. DO you remember the formula? Glob of snot, 3 drops of Plague, handful of kelp, exactly 2 mushrooms. Then, add a dose of healing potion, and a dash of airther vitae, and give it to the test subject. And keep your fingers crossed! First, let's get to work on curing the villagers. Fight them until you can get them sprayed down nice and good, and then send them outside to me. That way, we'll make sure they don't get re-infected before we can destroy the rest of the Dragon Plague! Hey, look! Everyone's feeling so much better now! Alright, next you're going to go back in and spray down all of those… globs of snot that Phlegnn has sneezed everywhere. Hey, it's working! Good job! Now, you're going to go spray down the castellum - that's the big pool of water in center of town. It acts as the town's main source of water, so until it's disinfected, the Dragon Plague will continue to spread. Make sure you clear ALL the slime, without it, the SnotGoblin Prime will never leave. Click on the arrow on screen 6. Requirements: Must complete 'Cured is NOT GOOD' quest. So, after you killed Phlegnn, I decided to stick around and run some experiments on plague samples I still had. I HAVE MADE A TERRIBLE MISTAKE. I mutated the plague, and then I lost it! I'll sleep earlier if you tell me you've found and destroyed it. But, you know. Don't tell me you've done it until you actually HAVE done it. That will be very uncool.